Design to harmonize the beauty and function. Made of stainless steel filter which was particular about beauty and material, coffee oil is a flavor component can be extracted more. It is a set of pot and coffee dripper design to harmonize the beauty and [Features] and functions. • In stainless steel filter which was particular about beauty and material, coffee oil is a flavor component can be extracted more. Kinto Carat is a Coffee Brewer with design, elegant looks, and also function very well. Which it brew decent coffee. There’s two part of the brewer, the filter brewer with glass funnel and metal filter, and also the coffee pot itself. The filter brewer in the top could be sold separately, and use on a mug or other coffee pot. The brewer intend to use the glass funnel with small hole limiting the flow speed result in a strong taste brew. Also the coffee without the paper filter preserve the remain oil in the beans, taste differently. One common issue the metal filter brewer has is the coffee residual/powder in the cup. The metal filter of Kinto carat has very fine holes, result in very less coffee residual, however, it may be affect by grinder performance, if there’s a lot fine powder from your grinder, and it may still left in the cup. 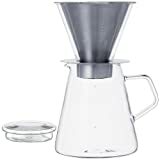 For my brew, I use an adjustment of coarser grind, infuse for 45 sec, and add the water slowly into the brewer, complete 450cc water in about 3 and half minute. The result cup taste strong with more fullness of whole coffee body, and taste alike CCD brewer, between V60 and aeropress. Of course, I believe you can tune your result by changing the recipe. There will be fine powder in the result cup using Vario, however, it is almost not noticeable. In summary, the Kinto Carat set is a fine coffee brewer with a modern elegant looks, and also brew great coffee, highly recommended. I got my set from Carla Japan on Amazon, you can get almost anything you like from Japan through their service. They have great service help you finding stuff, and well package, and prompt shipping, and also for a good price. I highly recommend their service as well.